The photo I am sharing today for Sepia Saturday is one of my favorites. 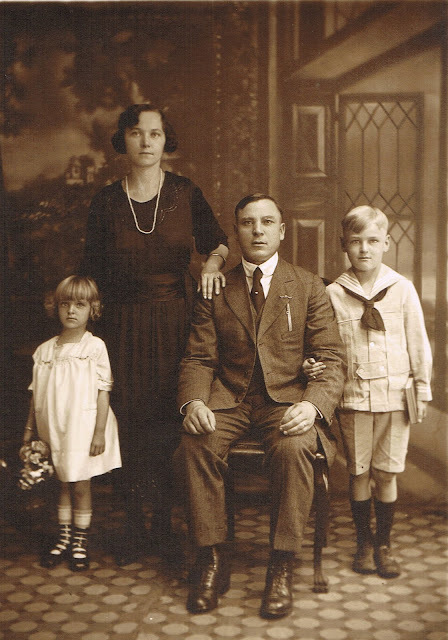 This little blondie is my paternal grandmother Helen (you've seen her here before), with her brother Steve and their parents, Josephine Nitkiewics and Peter Zempolurch. I am not really sure how to spell the name "Zempolurch", but I have also seen it as Zempolich, Rzempoluch and just shortened to Zempol in various places over the years. If you are enamored by my grandmother's cute little black shoes, you can click over to this post from last month to see my comparison of these shoes to a more updated version. As you will see, she was very fashion-forward. I never met Steve or Peter, but was fortunate enough to have my grandmother in my life until I was about 12 years old, and my great-grandmother Josephine until she died a year later when I was 13. Josephine was a sweet, quiet woman who came to the U.S. from Poland in the early 1900s. They lived in New Jersey, which is where this photo was probably taken. For more historical photos and stories, stop over to Sepia Saturday today. Have a nice weekend everyone! I love old pictures, I have many of my grandmother too. This is wonderful. I wish I had old pictures of my family. This is such a gorgeous photograph. The little girl is so sweet! What a fabulous photo! You are so lucky to have it. What a little cutie your grandmother was and I DO love the shoes! What a fun piece of family history to have. Old photos are so intriguing. I don't know what it is but your grandmother looks very aristocratic - very poised and proper - and also very delicate and beautiful! Have you posted a photograph of her as an adult? What a great photograph, so much you could read into it. Your grandmother has a lovely sweet face and they all look very upright and respectable as I am sure they were. I can imagine the flurry of getting in front of the camera and looking just right. When I looked at them I imagined 'Polish', great people. Oh yes those shoes are so modern. Nothing new under the sun! Love all the clothes, especially the boy's sailor suit. What a treasure to have. I just love when you post these old photographs! they are so beautiful and how very special that you have so many! That's such a lovely photo ... I really should dig out some of my old family portraits. Awesome photo. And those shoes are really cool. I love the pocket watch chain. I still have my grandfather's watch and chain. Thanks for sharing and thanks for visiting my blog. The shoes are like Gladiator sandals! Wonderful photo! for a formal picture, i still find it quite endearing. thanx 4 sharing! !